Join host Robert Forto as he welcomes dog musher, Meredith Mapes to Mushing Radio. Meredith is signed up to run the 2018 Iditarod as a rookie. She has been running sled dogs since she was a little girl. 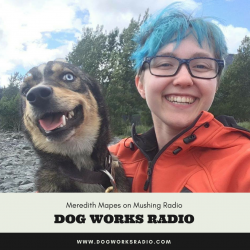 Meredith Mapes, owner and head poop scooper at Fun On The Run Kennel, was raised in Alaska and has been around sled dogs for most of her life. She was first introduced to sled dogs at age 6 through Girl Scouts, and at the Willow Winter Carnival 1-Dog race in 2001 she won by just 1/5 of a second. From then on she was hooked, and competed in a variety of 1-Dog races the next season before taking a break from mushing for a few years. At age 12 she was gifted with her first two sled dogs, which came from Mitch Seavey’s kennel. That fall she was gifted with two more dogs from musher Sue Allen, and Fun On The Run Kennel was born. The kennel continued to grow the next year, and she trained her own team for her first big mid-distance dog race – the 2008 Junior Iditarod, where she finished in 14th place. Everything changed for Meredith when her dog team was hit by a snow machine during the Aurora 50/50 in December 2008. Her two main lead dogs were injured, and she was shaken up but uninjured herself. She competed in the Junior Iditarod finishing 8th that year, but her heart wasn’t really in racing anymore. After high school Meredith officially called herself retired from sled dog racing, and started college. She was offered a job working in Seward, Alaska at Seavey’s IdidaRide Sled Dog Tours, and had a blast working with sled dogs again. Within the first week she said she’d be running the Iditarod in just a few years, and blames Danny Seavey for offering her that job and getting her back into dog mushing (and he continues to feed her mushing addiction to this day!). Meredith graduated from college in May 2016 with a Bachelor of Arts in Theatre with an emphasis on Dance from the University of Alaska Anchorage. She’s excited to be running dogs from her own kennel in the 2018 Iditarod. And all of our individual dog sponsors! When did you get started in dog mushing? Tell us about your plans for running the Iditarod in Alaska. Tell us a story about one of your favorite dogs. Meredith shares a story about one of her lead dogs, Sara Jane!